Is it seriously the end of July already? Wow!! 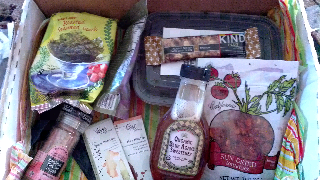 This month I received an AMAZING foodie package from Kat at A Girl & Her food! I was so excited whenever I got the package I couldn't wait to open it! She sent the most amazing food and ALL from Trader Joe's with the exception of her delicious homemade Kale chips! I was so excited because I have NEVER been to Trader Joe's before! I even got a Chocolate Bar with Bacon! Yes, Bacon! It was only 80 calories for a piece of heaven! I have heard so much about Agave sweetener that I couldn't wait to try it on my oatmeal as soon as I woke up the next day! Let me tell you that stuff is sweet! Chia seeds! I was just telling my friend that we needed to try these little boogers and see what we thought! I have almost used the entire bag up since I got it from Kat! I LOVE chia seeds now! I unfortunately won't be participating in August since I don't know my address for school yet and also don't know where I will be when the package is sent! I will definitely be back in September excited for a new pen pal! If you don't know what it is about here it is! Visit theleangreenbean.com for more details! What a bummer that you didn't get yours! Did she just never respond? And btw, WHERE did you find that bacon chocolate bar???!!! Thanks! My best friend is a bacon and chocoholic! The combination is perfect! I can't believe you didn't get a box. That is incredibly lame. We should go to peking order and eat your sorrows away. So lame! It is lame especially since it was my first month! I hope everything is okay with her. Yes, pecking order next week/weekend?? That sounds like so much fun, except for people who ruin it by not doing what they agreed to do :( Of course, I've learned, you never know what may be going on in someone's life; maybe you will hear something soon. And I LOVE Trader Joe's!! I agree. I hope all is okay with her. I love TJS too!! !